When Captain Morgan asked Campfire to launch its new rum-based shot with an attention-grabbing stunt, we knew there was only one way to create massive buzz... by having a blast! “Doing a shot” is a sure-fire start to a great night with friends – a social ritual that often leads to epic bar crawls. So to launch Captain Morgan’s new Cannon Blast, we created something equally epic: the world’s first Human Cannonball Bar Crawl! 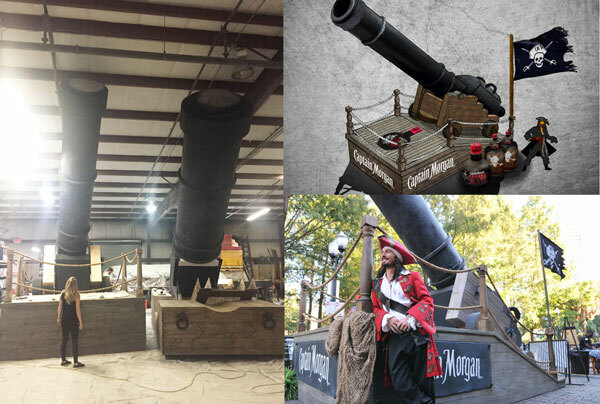 Working alongside Brian Miser (one of only ten working Human Cannonballs in the world today) and fabricators from Disney World and Universal Studios, we created two enormous custom-built cannons, designed specifically for our death-defying stunt. Our goal: Shoot a man 50 feet in the air above a crowd … not once but twice… for a total distance of over 300 feet. From bar, to bar, to bar! Taking over downtown Orlando for one day in October, we planned and executed a unique stunt that drew thousands of fans to location. Also in attendance were local and national press, and a select group of celebrities and influencers. Partygoers were able to behold this traditional circus stunt like never before, all while sampling The Captain’s new product. The entire event was also Periscoped live by comedians at Funny or Die, and captured by our team in this BTS video. Within 24 hours, we’d edited a 60-second video of the event designed exclusively for social distribution (it’s at the top of this page). Since its release, the video has been viewed on Facebook more than 1.2 million times, and the overall campaign earned over 100 million PR impressions. The event contributed to the Captain Morgan brand outperforming the declining rum category in 2015, driven — according to Diageo — by the launch of Cannon Blast. "After the second blast from the cannon was successful, I knew Captain Morgan had a hit." –B.S.O.